The ongoing Jabong Online Fashion Week (JOFW) exclusively collaborated with some of the coolest upcoming Indian designers to bring out affordable collections for the masses. That isn’t the only special part about the event; it is the first shop-able fashion week. The idea is that while you’re watching the models showcase a fresh new collection, at that very minute the outfit is available to be bought online on Jabong.com. 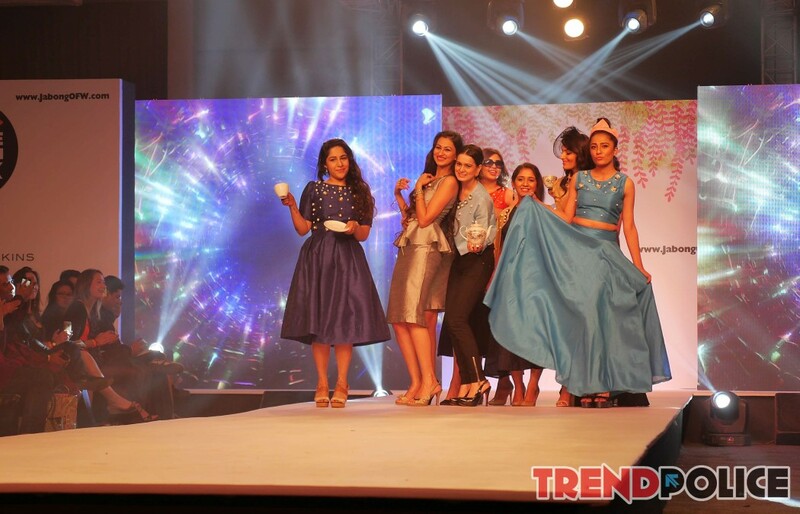 This event blurs the lines between the online and offline fashion industry in India. Nitya Bajaj, the go-to designer for evening gowns in India, kept with the JOFW theme and did her bit in breaking the wall separating the online and offline world. To showcase her exclusive collection for Jabong, she managed to gather the who’s who of Delhi’s online world to walk the ramp. These are the girls who have used the power of the internet right and worked their way to the top of their fields. The “chosen ones” included Sukhneet Wadhwa, who is known for her style blog Ms Coco Queen. She shows off her personal style file with editorials and a selection of trendy photoshoots. Another, Rasna Bhasin is a young enthusiastic entrepreneur who has dabbled with blogging, styling and modelling. She has an intense passion for her work and seems to be on a mission to shake up the Indian fashion industry. The list also included Surbhi Sethi, founder of Head Tilt – a website dedicated to fashion, art, culture and style. Shailey Khera, a fashion consultant and blogger (Confessionz of a Closet), Srishti (Style Fashion Etc), Aanchal Sukhija (Delhi Style Blog) and Pallavi Chaturvedi (That Desi Girl). Apart from the fashion crew, Angel Bedi, aka The Filmy Owl, also joined the gang. She’s a graphic designer famous for her fun doodles which resonate her outgoing personality. Her work is perfect combination of crazy typography, quick-wit and a large dose of Delhi-ness. Coming to the collection, Nitya Bajaj themed it around a vintage tea party – flared airy skirts, crop tops with pearl embroidery detailing paired with scarves, lace gloves and vintage sunglasses. The silhouettes ranged from free flowing skirts to shapely peplums. The crop-top trend seems to carried forward to Spring/Summer 2015, and Nitya made it work well. 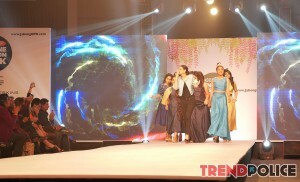 Well-cut blouses paired with skirts in matching block pastels dominated the floor. 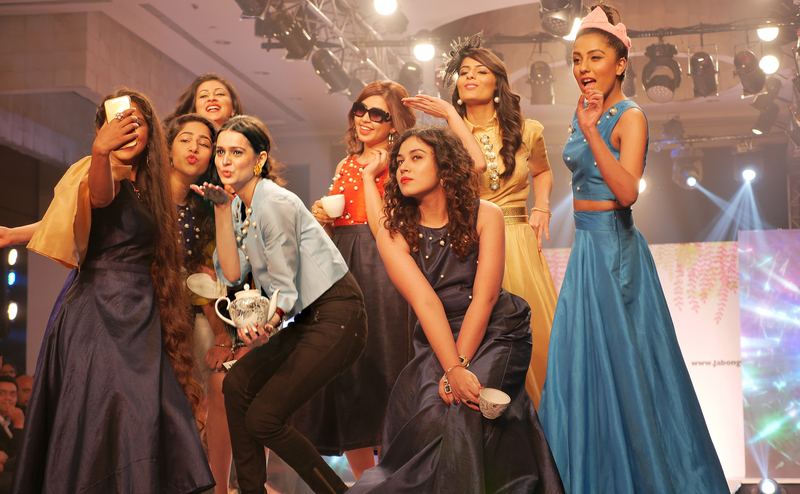 The collection was beautiful, but the highlight of the show remained the energetic tea party, when Nitya Bajaj and her blogger army, strut down the runway. The group danced around the stage in celebration to upbeat music, gathering a round of cheers from the audience; there was a smile on every single face in the crowd. Perhaps for the first time, the models had as interesting a personality as the outfits they were showcasing.